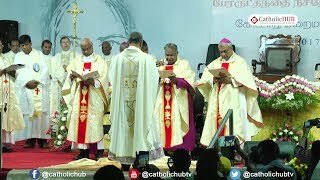 Tamil Nadu Bishops’ Council is the official organization of Tamil Nadu Catholic Bishops. It comprises all the 18 dioceses of Latin Ecclesiastical Provinces of Madras-Mylapore, Madurai, Pondicherry-Cuddalore and 3 dioceses of the Oriental Rites in Tamil Nadu . Tamilnadu Latin Bishops’ Council is the official organization of Tamilnadu Catholic Bishops of Latin rite. It comprises of 18 dioceses.